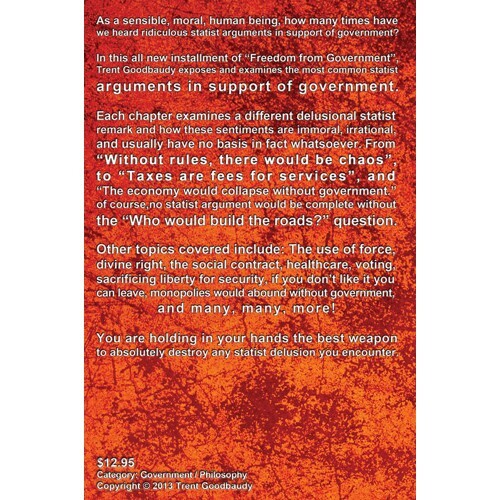 In 'Freedom from Government; Statist Delusions' by Trent Goodbaudy, Trent challenges the most used tired old arguments for statism and offers viable solutions to our current wreck of a corrupt, old, tired, and bloated political system. You can pre-order your copy right here at SHOP.FreedomfromGovernment.org NOW, or at other select retailers including Amazon.com and Kindle. Enjoy this excerpt from the introduction of the new book, and make sure to pre-order your copy NOW! Be sure to visit and 'like' our new facebook page too! As a sensible, moral, human being, how many times have we heard ridiculous statist arguments in support of government? In this all new installment of “Freedom from Government”, Trent Goodbaudy exposes and examines the most common statist arguments in support of government. 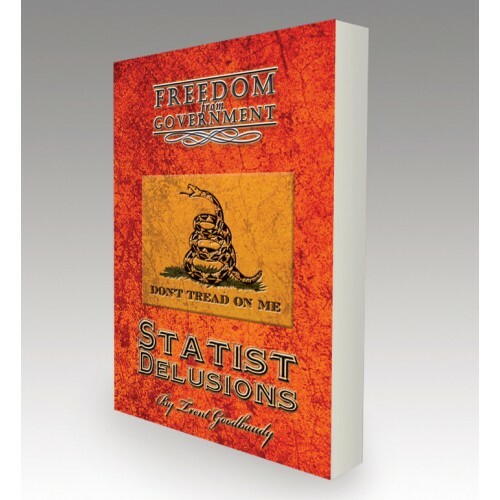 Each chapter examines a different delusional statist remark and how these sentiments are immoral, irrational, and usually have no basis in fact whatsoever. From “Without rules, there would be chaos”, to “Taxes are fees for services”, and “The economy would collapse without government.” of course, no statist argument would be complete without the “Who would build the roads?” question. Other topics covered: The use of force, divine right, the social contract, healthcare, voting, sacrificing liberty for security, if you don’t like it you can leave, monopolies would abound without government, endorsing the government by taking a benefit from it and much more! This book is the best weapon to absolutely destroy any statist delusion you encounter.